Following the coast from the North of Gironde to the South of the Pyrénées-Atlantiques, the Vélodyssée cycle route passes by many prime tourist sites. You can easily ride the whole length in ten days or less. 590 km from Paris to Bordeaux on autoroute A10, 790 km till Saint-Jean-de-Luz. TGV from Paris Montparnasse to Bordeaux. The journey takes from 3h15 to 3h45. TGV from Paris Montparnasse to and Saint-Jean-de-Luz and Hendaye. The journey takes from 5 h 30 to 5 h 45. Air France flights from Paris Orly to Bordeaux and Biarritz. A 1,256 km long cycle route connecting Roscoff, in Brittany, to Hendaye, in the Basque Country, the Vélodyssée allows you to leisurely cycle along the Atlantic coast from the Loire estuary to the Spanish border. 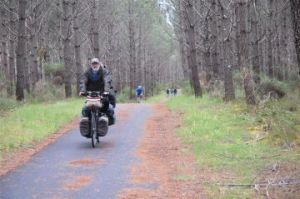 An itinerary that is for 80% over dedicated cycleway. But, the other side of the coin is that during summer, near urban areas, the trail is often busy with families walking with strollers and people rollerblading or taking out their dog. So, some cyclists consider spring and fall as the best seasons to ride this route. At its southern end, the Vélodyssée goes through three departments of the Aquitaine region each offering very diverse prime natural and historical sites: the Gironde, the Landes and the Pyrénées-Atlantiques. Except in the latter, this stretch of 400 km is mostly flat and therefore easy to travel for families with children. In addition, if necessary, some shops rent electric bicycles. You can find them on the Vélodyssée website which also lists accommodation holding the " Accueil Vélo " label meaning they meet the needs of cycle tourists. Located no more than 5 km from the cycle route, they offer luggage transfer, secure bicycle storage, repair kits, early morning breakfast, picnics takeaway and so on. If you choose to start your journey from the North, Lacanau Océan is a convenient place to join the route of the Vélodyssée. This town is indeed connected to Aquitaine’s main city, Bordeaux, by public bus and a 50 km long cycle path that mostly runs through pine forests and passes nearby a few vineyards of the Haut-Médoc appellation. However, there is a wilder and more hilly area between Lacanau and Lacanau Ocean where are nestled several natural lakes. Of particular interest is the Cousseau pond Nature Reserve that covers just over 600 ha of marshland and wooded dunes where you can observe many birds, deer, wild boars, badgers and if you are lucky enough European otters. Largest seaside resort in Gironde, Lacanau Ocean boasts 19th century villas, a casino and 14 km of white sandy beaches whose waves are very popular with surfers. Southbound, dunes and beaches come one after another till Cap Ferret where stands a 57 m high lighthouse and the climb of the 258 steps to the top offers a breathtaking view as it is situated at the end of the namesake peninsula separating the ocean from the Arcachon basin. A vast lagoon of 156 km2 at high tide, it is primarily known for its oyster beds but is also an excellent spot for fishing, sailing and swimming. The Vélodyssée goes all the way around it passing by picturesque oyster farming villages consisting of brightly coloured wooden huts with tiled roofs such as L’Herbe and Les Jacquets. Nicknamed the oyster capital because more than half of the 300 oyster farmers of the basin are installed there, Gujan–Mestras boasts a “Maison de l’Huître” providing information on the ecosystem of the basin and oyster farming and hatchery methods. Nearby, the Teich bird sanctuary is the wildest part of the region. Occupying a river delta, it is the nesting ground for several species and provides ideal marshland for migratory birds stopping on their long journeys between Scandinavia and Africa. Thus, more than 300 species of birds can be spotted from 20 observation posts scattered along a 20 km walking path and a few huts are available for those whishing to spend the night in this haven of peace. The Arcachon basin has also many beaches and several resorts like Lège-Cap Ferret, a millionaire favourite destination, and Andernos -les- Bains where once stayed actress Sarah Bernhardt and the painter Toulouse- Lautrec. The artist also frequently visited Arcachon, today the largest and best know resort where the Ville d'Hiver is a must see. Built in the 19th century, this neighbourhood contains many villas listed as historical monuments. Arcachon is also the gateway to one of the most remarkable natural sites of France, the Dune du Pilat (or Pyla, both spellings are acceptable) the tallest dune in Europe that reaches the height of 110 m and is 2, 7 km long. Walking up to the summit is not too demanding and provides a great view over the Arcachon basin. The Vélodysée then enters the Landes, once a swampy land that has been drained and planted with pines in the 19th century. So, the cycle path mainly runs through a pine forest, but the journey is not too monotonous because there are also a few plots of very old of cork and white oaks that winds have molded into strangely and beautifully twisted forms over the centuries. Besides, the ocean is always on hand, rarely more than 1 km away and many paths lead to the one continuous ribbon of white sand that makes up the coast of the Landes. Accommodation can be found at seaside resorts like Biscarosse, Mimizan, Seignosse and Capbreton, all internationally known for their long pristine beaches and surf spots. In addition, the Vélodyssée also passes by several lakes located five to ten km inland and the one near Leon is particularly interesting. It is indeed connected to the sea by the Courant d'Huchet, a small meandering river that digs its way through an exuberant, almost sub-tropical vegetation, then through constantly changing sand dunes. An amazing scenery you can discover hiking or on board a flat-bottomed boat made for navigating the shallow streams. Preserved from the plantation of the pines as well as from draining the land, the Courant d’Huchet has been designated a nature reserve for its wealth of wildlife and for its variety of habitats. Shortly after passing Capbreton, where a vineyard was recently replanted in the dunes, the Vélodyssée leaves the coast and reaches the Basque country at Bayonne, its capital, that boasts a rich architectural heritage including many traditional timber-frame Basque houses and a superb Gothic cathedral. But the cycle path soon goes back to the coastline and then follows it till the Spanish border. First, beaches are similar to those in the Landes and surf was first introduced in Europe in Biarritz. A cosy seaside resort put on the tourist map thanks to Empress Eugénie in the second half of the 19th century, it has plenty to offer tourists: beautiful beaches, luxury hotels, Belle Époque villas, Art Deco buildings, vibrant nightlife, excellent restaurants,.. The town is also a foremost centre for thalassotherapy, with two large institutes offering a range of seawater therapies. As soon as you leave Biarritz to the South, the landscape changes drastically to rugged coastline and cliffs. As a consequence, the Vélodyssée comprises some very steep sectors but they don’t last long and you are rewarded with superb views and the discovery of picturesque traditional villages such as Bidart and Guéthary. Then comes Saint-Jean-de-Luz, one of the most attractive towns in the Basque Country as it combines a beautiful, long sandy beach with an historical centre full of Basque buildings and awesome surf conditions. There is also a small fishing port where you can watch fisherman pull in large catches of squids, locally called chipirons, soles, hakes, anchovies and tunas. The perfect place to end your journey and relax, but if you absolutely want to travel the Vélodyssée till its very end, Hendaye is only 14 km further.